As a child, gaming was a ceaseless joy. Every game was a new experience, a fresh pleasure, a fountain of creativity from which flowed wonder and inspiration; years of sheets of A4 paper scrawled with Mega Man, Oddworld, Mario and Sonic level designs will attest to this. Nowadays, the magic has dissipated—we’re much closer to the conjuror now, and we can see the cards up his sleeves. It’s too late; we know too much. We know where babies come from. 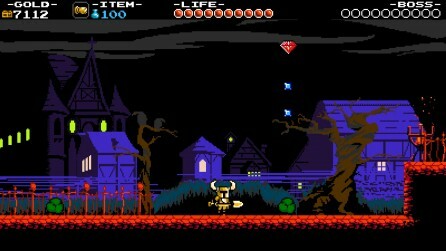 Kickstarter smash-hit Shovel Knight is one of many, many games that have tried to recapture that ethereal feeling, to evoke that wide-eyed-child-on-Christmas-morning sensation. There have been successes, for sure—Mega Man 9 and 10 stand out—but by and large, the “retraux” styling has become passé. A new piece of rushed nostalgia bait hits the Steam storefront on a daily basis, a testament to the indie developer’s capacity for being just as uncreative and prone to bandwagon-hopping as any reviled AAA software house. Yacht Club’s inaugural title, then, is up against it from the start. NES-style graphics! Yeah, seen ’em. Chiptunes! Uh-huh, tell us another. The shock of the old is gone. 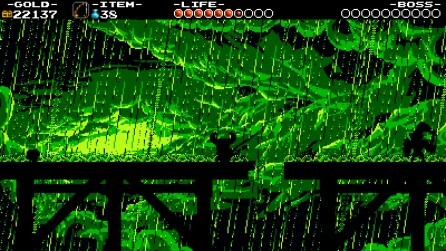 8-bit platformers have resurged. The freshness is gone, and the old-school has been buried once more. 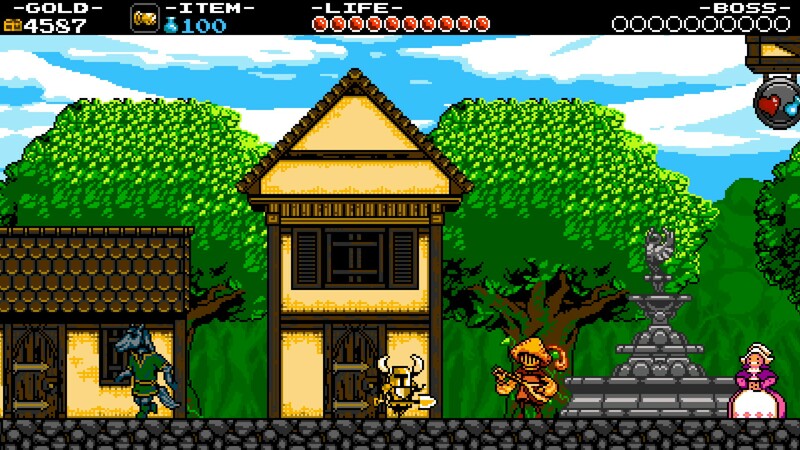 With style, grace, and loving care, Shovel Knight takes up his namesake gardening tool, penetrates the earth, and exhumes a genre. Playing through Shovel Knight, it quickly dawned on me that I was playing a modern classic. More interestingly, there is no single element I can point at and say “this is it; this is the thing, this is the moment”. The entire game is crafted. This is an artisan’s platformer. Secret spots are placed carefully, requiring observance to notice and raw skill to access. The level designs are textbook, with new obstacles placed in safe spots so you can learn their foibles before the difficulty ramps up, Shovel Knight‘s fascinating and astonishingly original gimmicks being arranged in steadily more complex death courses. Every mechanic has been mulled over, inspected, chipped away at, discussed. The much-lauded checkpointing system appeals to all comers—activate the checkpoints to avoid losing too much progress when you die, or destroy the checkpoints to collect the treasures within at the cost of that convenience. It’s such an elegant piece of design that it shocks me to have not seen it before. There’s a similar mechanic at play in Gaijin’s Runner 2: Future Legend of Rhythm Alien, but here it’s a revelation rather than a frustration. 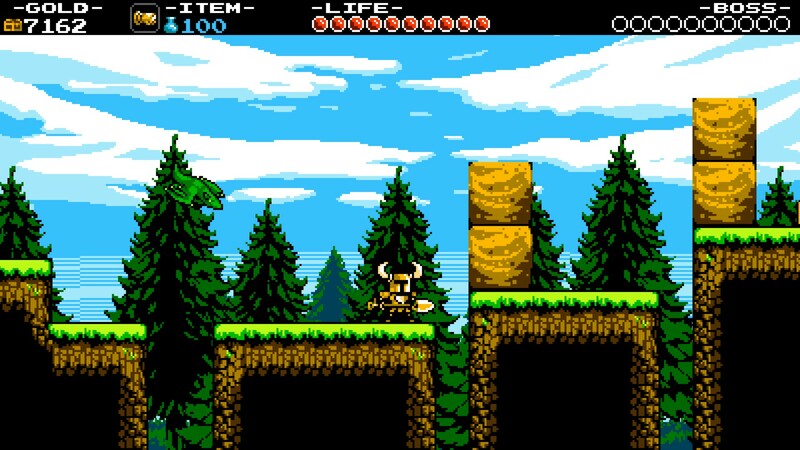 The game’s fairly high difficulty is, optionally, further tamed by the Relics, a sizeable collection of hidden and purchasable items that can be utilised to navigate Shovel Knight‘s many traps with relative ease. They are tied to your Magic, a stat that acts much like Castlevania‘s “Heart” system, and can be upgraded in one of the game’s two villages. These were initially a cause for concern for me, but I quickly discovered that these “hub” areas are concise, tightly-packed, and as full to the brim with secrets and fun content as every other area of this game. The Relics allow you to shoot ranged fireballs, or—most usefully—activate mercy invincibility (a couple of seconds’ reprieve, as if you’ve been hit by an enemy) amongst many other effects. The latter Relic makes the game outrageously easy, especially since it’s relatively trifling to power up your magic to its maximum level, allowing for approximately twelve (replenishable) “casts” of this power and fairly constant invulnerability. However, these Relics are completely optional, and there are achievements and rewards tied to abstaining from them. 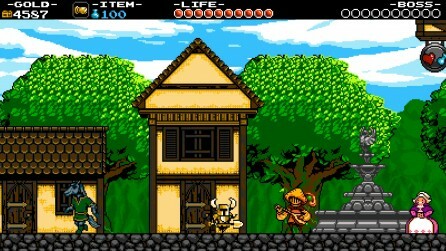 In fact, Shovel Knight caters very well to a broad audience, with its difficulty completely in the hands of the player. The different Relics cater to different play styles brilliantly, allowing for a speed run or careful, measured approach to be equally valid. It never feels as though you’re beating up against a brick wall, even in the more challenging New Game Plus difficulty; it’s tough, but fair throughout, with no cheap shots or cheating bosses. It’s a learning experience up there with the absolute best, splicing modern videogame friendliness to old-school videogame cruelty in the most skillful way I’ve ever experienced. Graphically, the game largely adheres to the NES aesthetic, though it feels smoother and a little bit more spectacular than the old Nintendo’s output. The sprite art is fantastic and intricate, the backgrounds are excellent, and each stage is unique in both appearance and feel. The one criticism I can muster is that the near-pitch-black stage sporadically lit by lightning strikes can be quite frustrating, though that’s a very subjective gripe as I’ve never really liked stages with that kind of “lights out” mechanic. The music by Jake Kaufman (Popularly known as virt) is equally wonderful and instantly memorable, working perfectly with the game’s “NES on steroids” aesthetic. There are plenty of reasons to replay Shovel Knight, the aforementioned New Game Plus being just the tip of the iceberg. There are dozens of hidden musical scores lying around the expansive levels, each of which can be brought to the village bard for money and future listening. There are secret bosses on the world map, hidden Relics, armour sets to purchase (the golden armour being a particular treat with a hand-over-mouth-gasping-with-delight secret I won’t spoil here), shovel upgrades, and a ton of achievements for wacky and/or dangerous feats such as clearing the game without spending a penny (not in that way, shush) or not collecting any health items. It keeps on giving, and there’s even more content to come—gender-swap and challenge modes have been promised. Shovel Knight is the absolute rarest of games, an anomaly. It’s a Kickstarter title that not only lives up to its absurd hype, but actively exceeds it. It’s the indie platformer that takes the crown from the still-magnificent Cave Story as the absolute pinnacle of its type. It effortlessly appeals as both nostalgia and a fantastic modern game in its own right. In closing, I dig it. Excellent review, and I got a bigger laugh out of the end of the first paragraph than is probably socially acceptable. I’m even more excited to play this than I was before; Kaufman’s music is one of the few reasons I have any fond memories of Scurge: Hive, so I’m looking forward to playing what promises to be an awesome game with his audio stylings moving me along.